Click here to read article on the Idaho Mountain Express. 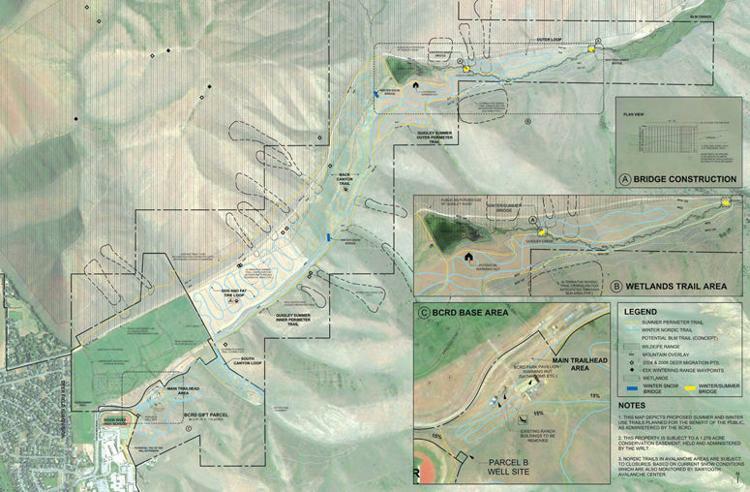 After five years of work in Croy Canyon, the Blaine County Recreation District expects to start work cutting a new network of trails in Quigley Canyon this week, breaking ground on what will become its primary Nordic park in the south valley. The goal is to greet the 2018-19 Nordic season with 10 to 15 kilometers of groomed terrain, according BCRD Executive Director Jim Keating. Trail crews are also starting work on a 4- to 5-mile summer trail around the perimeter of the canyon, which will eventually be open to hikers, bikers and horseback riders. “The landowners in Croy are amazing folks—they allowed us access to their properties for many years,” Keating said. “But those land-use agreements were not in perpetuity. That’s because a June 2017 annexation of Quigley Canyon into the city of Hailey requires that some land stay open for public use, including a parcel behind Wood River High School given to the BCRD. The trail starts there. Then, it moves through a conservation easement east of the future development extending some 4 miles to the back of the canyon. Eventually, the BCRD plans to add a sledding hill, a warming hut and infrastructure to the trailhead. Late last week, Keating was still waiting on input from the developer before moving forward with those steps. It’s a harmonious return for the BCRD, which operated its Nordic center in Quigley until 2012. That summer, Quigley landowners pulled access following a failed application for annexation into Hailey. So the BCRD struck a deal among the city, the Croy Canyon Ranch Foundation, the Blaine County School District, the Wood River Land Trust and the Simons family to build 9 kilometers of trails spreading west from Lions Park. Quigley, though, always had convenience on its side: In its prime, the 13-kilometer network pulled between 12,000 and 13,000 skier days per year. In 2016, a BCRD study identified Hailey as the valley town with the highest need for additional recreation facilities—and unpaved single-track trails topped the wish list. While the south valley has its share of public land, most of the access is on private property, Keating said. Quigley is a key bridge, creating a direct line from the BCRD’s home at the Community Campus to BLM acreage east of the drainage. The BLM is currently in the process of drafting its own travel plan for the Wood River Valley, which would extend the network even farther. The agency is in its scoping phase now, with a final decision on routes and uses estimated for January. In all, the BCRD already maintains some 160 kilometers of groomed trails, about a third of which surround Galena Lodge, 23 miles north of Ketchum. Keating said he hopes the quick access to the Quigley system—which runs right to the back door of Wood River High School and College of Southern Idaho at the Community Campus—will open up partnerships and program offerings in the south valley. For more information on the project, go to bcrd.org/projects or call BCRD Communications Manager Jenna Vagias at 208-578-2273. “We are excited to be working with Quigley Green and the Wood River Land Trust to connect youth, adults and seniors to accessible outdoor recreation in this treasured and beautiful canyon so close to our community,” Keating said in a statement.